Former member, Plateau State House of Assembly, Sunday Abdu, said the identity card was seen at the scene of an attack where people were killed. 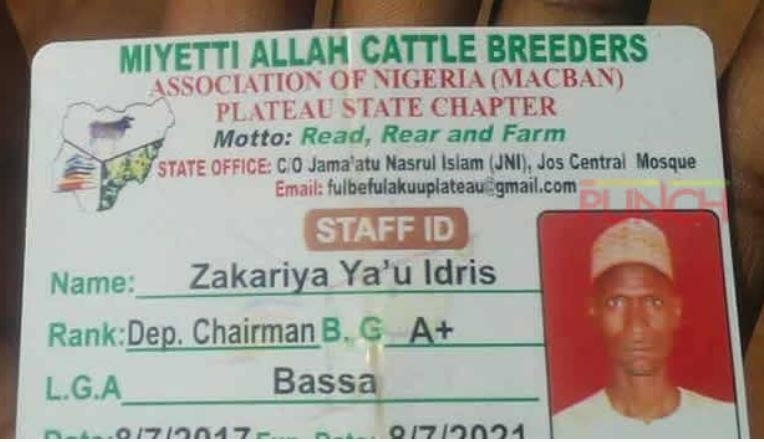 An identity card belonging to the Deputy Chairman of Miyetti Allah Cattle Breeders Association of Nigeria in Bassa Local Government Area of Plateau State, Zakariya Ya’u Idris, is now a subject of controversy. The Police authorities said they had commenced investigation into the matter. While the Irigwe Development Association alleged that the document was recovered at a scene where some persons were recently killed by suspected Fulani herdsmen, MACBAN said the ID card was stolen by Irigwe youths who attacked the house of Idris while he was worshiping in the mosque. The President of IDA and former member, Plateau State House of Assembly, Sunday Abdu, said, “The identity card was seen at the scene of an attack where people were killed. “The issue of identity cards is a small matter. We also recovered telephone handsets.